Having recently finished reading Chuck Wendig’s novel Life Debt, the latest addition in his Aftermath trilogy which chronicles events taking place after the Battle of Endor, I felt compelled to write a reaction to the novel. Or rather, I felt compelled to write a reaction to a particular element in the novel, namely, the way(s) in which Wendig masterfully describes the suffering of the Wookiees and their home-world of Kashyyyk. Momentarily, I will share some of these details with you, and in doing so, I hope I am able to paint an equally worthy picture of devastation and enslavement. But before I begin, I want to note two things. First, if you have not yet read Life Debt and do not want it to be spoiled, I would encourage you to stop reading and check it out. While I do not intend to provide a great deal of spoilers, they will never-the-less be present in the post. Secondly, and perhaps most importantly, what I am presenting about the imagery in Life Debt is also going to lead to a rather embarrassing continuity issue (hence the name of the post). While I recognize it is slightly annoying for me to say this and not tell you what that issue is right here and now, I promise that the reason I am making you wait is worthwhile. Read on and you will see what I mean. Of course, the planet is not only described from a distance, but also when the characters arrive there and start working towards freeing prisoners and liberating the world. Added to the imagery, then, is a world that was once teeming with life, specifically Wookiee life Incredible Wookiee cities, such as the city of Awrathakka, are depicted as being built in and around the “skytower-like wroshyr trees – trees whose trunks are of an unimaginable circumference.” Further, the symbiotic relationship the Wookiees had with these trees is noted, a “sacred and biological” bond grounded in care. The trees provided nourishment and shelter, enabling the arboreal lifestyle of the Wookiees. In return, the creatures tended to the life of the trees, building their cities in a way that followed “the bends and turns of the trunk,” a clear sign of the respect the Wookiees showed the magnificent lifeforms. Sadly, Life Debt describes in even greater detail the devastation Kashyyyk and its Wookiee inhabitants have endured under Imperial rule. Under the protection of an Imperial blockade, Kashyyyk – classified G5-623 by the Empire – is “an occupied world,” “a prison planet.” The Wookiees, we learn, were corralled into labor camps and used as slaves, their impressive size and strength a valuable resource for the Imperial war machine. In fact, in the first Aftermath novel, we learn from Han Solo that the Wookiees were utilized in the construction of both Death Stars. A sad but unsurprising discovery. While Wookiees are shipped off-planet to work on military projects around the galaxy, the vast majority were kept in the camps on planet, forced to participate in the slow destruction of their native world. One camp in particular is depicted in Life Debt, Camp Sardo. Home to 50,000 Wookiee slaves, the camp is built at the base of the wroshyr tree to which Awrathakka clings. There, like so many other camps that litter the planet, the prisoners toil under the harsh yoke of the Empire, digging into the roots of the tree for its wood and harvesting crystals from its fungal nodes. Additionally, Wookiees in this and other camps are also forced to grow food for the Empire, to fight for entertainment, are bred to keep up the labor population, and even subjected to chemical and medical experiments. Moreover, we also discover that the Wookiees are kept in check with the use of inhibitor chips placed on the back of their necks, devices which keep them docile. These chips give a powerful shock to any Wookiee attempting to escape a camp, a shock that could prove to be fatal. Plus, since the Wookiees are family-oriented, any disobedience may harm not just the individual, but members of their family as well. In these ways, the Empire keeps their slaves from revolting. Still, we know that at least one Wookiee revolt took place about four years prior to events in A New Hope. This is not mentioned in the novel, but rather is an incident detailed in a short HoloNet News report. In it, the reporter explains that a Wookiee revolt was quelled by the 212th Attack Battalion, with tighter restrictions on travel to the planet being put into place by the Imperial overlords. Of course, the report is an obvious form of propaganda, making it difficult to say if the newscaster is telling the entire truth. Still, we can presume that whatever happened would have forced the Empire to use even harsher measures against their slaves (perhaps this is when the use of inhibitor chips began) and Life Debt makes it clear that eight years later, any chance of another Wookiee revolt has been ended. As I said at the outset, Wendig paints a fantastic, albeit incredibly bleak picture of the Wookiees and their beloved Kashyyyk. A world that was once vibrant – vibrancy we can actually see in Revenge of the Sith – is all but devastated. The barest glimmer of life still clinging to the branches of the splintering wroshyr trees; the native Wookies, “slowly being ground to dust” as Princess Leia declares in the novel. As I read Life Debt, I was profoundly moved by this imagery, saddened by the Empire’s flagrant destruction of Kashyyyk, disturbed by the harsh and murderous treatment the Wookiees must endure. In this way, Life Debt did what good storytelling should do, forcing one to dig deeper and mine the depths of their own being, thinking about ways that in our own world we might alleviate the suffering of others. The Wookiees and their world might be fictitious, but their plight should motivate us to want to help those who are also in need. And yet, all of the devastation and plight in Life Debt, the detailed imagery of destruction and enslavement, doesn’t line up with what is depicted in Issue #005 of Marvel Comics Chewbacca series. In fact, to be entirely blunt, not only does the description of Kashyyyk and the Wookiees in Life Debt not line up with what we see in Chewbacca #005, the two canonical sources are just flat-out contradictory. I won’t provide an overview of the entire plot of the Five-Part Chewbacca series, but I will note that the premise revolves around a personal mission Chewbacca undertakes sometime after the destruction of the First Death Star. In short, Chewie is heading to Kashyyyk so he can deliver an item to a young Wookiee. And, after an adventure on another world, Chewbacca does just that, flying an A-Wing Starfighter right up to his home-world, a world that is clearly NOT under Imperial blockade. Landing safely in a thriving city among healthy looking wroshyr trees, Chewbacca interacts with many Wookiees, all of whom are quite obvious NOT enslaved, no inhibitor chips stuck to their heads. Plus, to top it off, in the very final panel of Chewbacca #005, the Millennium Falcon descends to the planet with quite ease, no Imperial ships in pursuit. Chewbacca travels to Kashyyyk, landing safely on the planet. Landing safely, Chewbacca makes his way through a Wookiee city. How did they miss this continuity issue? Frankly, I think Star Wars fans deserve an explanation about why two contradictory versions of Kashyyyk and the Wookiees were allowed to enter the Star Wars canon. While I understand that small errors can and will be show up, an inevitable side-effect of having numerous story-tellers adding to a fictional universe, when far more obvious errors like this one appear, then someone on the Story Group (or at Lucasfilm in general) needs to come forward and at least acknowledge the mistake. Plus, as a fan, I want reassurance that the cohesive and unified story being told will not have these problems in the future, particularly since I spend a lot of money on books, novels, games, movie tickets, etc. Otherwise, I have to be honest: if more and more major continuity issues start showing up, my enjoyment of the canon won’t just diminish, but I will seriously consider closing the door on my Star Wars fandom. Addition: Having conversed with a number of people about this piece, including a member of the Story Group, I am working on a follow-up which will be posted here in the coming weeks. Stay tuned! Spoiler Alert: This piece contains information from the Princess Leia comic series. In the first part of this two part analysis, I examined the continuity issue between Return of the Jedi, where Leia describes her mother to Luke, and Revenge of the Sith, which shows the death of Leia’s mother when Leia and her brother are only minutes old. I will spare you a full rehashing of the first piece as you can go read it yourself, but I should note that, to date, no fix has come down from the people at Lucasfilm to settle this issue. Given the new commitment to continuity and canon in the form of a Lucasfilm (Star Wars) Story Group, which oversees all aspects of continuity in the Star Wars universe, I feel it is necessary for continuity issues like this be patched up for the sake of minimizing confusion. That being said, the question then is how can this particular continuity error be fixed? I noted a few solutions in the previous post, but also explained why these knee-jerk fixes would not adequately hold up. For this second piece, then, I want to present a possible solution that I think could work based off of how I personally interpret the scene in Return of the Jedi. Of course, I will hardly suggest that this solution will make everyone happy. Instead, I hope that by presenting it, and those of you who add to it or provide your own solutions in the comment section, will inspire the Story Group to act in the future to reconcile this confusion. Bail Organa has deceived his adopted daughter for her own safety. I am led to believe that the woman whom Leia is describing to Luke in Return of the Jedi is a real person Leia actually knew in the flesh. To me, this makes sense given the intimacy of the scene and what Luke is asking of Leia, wanting to know something about the mother they share but whom he never knew. However, if she is describing a real person, then the question becomes who exactly is this woman she is describing? I will come back to this in a moment, but first, let’s talk Revenge of the Sith for a second. After Luke and Leia are born, and once Padmé dies, Obi-Wan, Yoda, and Bail Organa make the decision to split up the twins lest the new Emperor discover them. Ultimately, the danger the twins faced was too great to keep them together. Luke was taken to Tatooine by Obi-Wan to live with Uncle Owen and Aunt Beru, and Kenobi stays to keep a watchful but distant eye on the boy. In turn, Bail Organa agrees to adopt Leia, noting that he and his wife had considered adopting a baby girl. 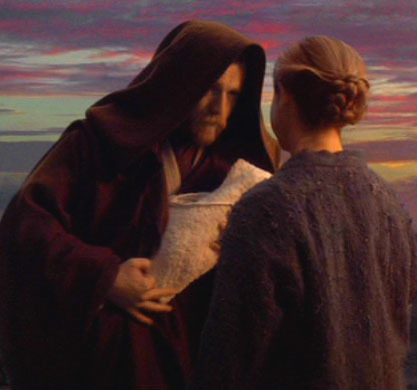 In one of the final scenes of Revenge of the Sith, the viewer sees Leia being presented to the Bail’s wife Breha, the Queen of Alderaan, who holds the child and then the scene ends. But it is what happens immediately after this scene ends where the lie to protect Leia is instituted. Immediately after the scene cuts out, an unknown woman enters, walks up to Bail and Breha, and the child is handed to her. This woman is a close and loyal confidant of House Organa, and she will raise the baby for only a short time, until Leia is old enough to form an image of this woman in her mind as her “real mother.” This is precisely what Bail wants and expects to happen, that Leia will believe this woman is her mother. When Leia is still very young, a situation will arise that causes this woman to leave Leia. Perhaps, fully committed to the deception, this woman actually does die. This would line up with what Leia says to Luke. Or, perhaps the woman’s death is a ruse, and instead, the woman goes into exile, far away, into the Outer Rim or even into Wild Space, living in solitude where Leia will never find her or encounter her again. If Obi-Wan Kenobi can hide from Darth Vader, surely this woman can hide from her pretend daughter. With the woman’s “death,” Bail and Breha Organa step back into the picture, officially adopting the young, orphaned Leia as their own. She will be raised and loved as though she were their daughter. As she grows, the memory of the other woman in will begin to fade, and she will only recall images and feelings. Leia will see herself first and foremost as an Organa, as the Crown Princess of Alderaan, the child of Bail and Breha Organa. Yet, Leia will still know that she was adopted, and that she only knew for a short time was her “real mother,” as she would have no other reason to believe otherwise. Perhaps, even Bail and Breha reinforce this from time to time, speaking about her “real mother,” describing her to the child. But why is this even necessary, why the lie in the first place? Precisely because Leia is in danger from the moment she is born. Darth Sidious and Darth Vader would know that Kenobi left Mustafar with Padmé. What they would not know, though, is that Kenobi, Yoda, and Bail Organa were present when Luke AND Leia are born. Recall that the Sith Lords knew Padmé was pregnant, but they did not know that Padmé was pregnant with twins. [i] After the children are born, in order to protect them, the two Jedi and the Alderaanian Senator decide how best to protect each child. What is presented at the end of Revenge of the Sith, then, is an elaborate series of deceptions in order to throw Sidious and Vader off the trail. Whereas Luke is hidden remotely on Tatooine in the Outer Rim far from Coruscant, Leia is essentially hidden in plain view on Alderaan and will become not only the Crown Princess of House Organa but Alderaan’s Senator. What I am suggesting, then, is simply one more layer to the deception, one that Bail Organa concocted as a fail-safe, one that protects Leia even from herself. Put yourself into Bail Organa’s mind for a second as he traveled with the child back to Alderaan after Padmé’s death. Knowing that he would have to tell the child one day about her mother, Bail knew he could never tell her about Padmé Amidala. If he was to do so, and Leia slipped up and spoke about Padmé publically as her mother, the result could be devastating…Vader could find out. Yet, Bail would also know that he had to ensure no questions would be asked about the child who is suddenly in his care. Remember that Bail was present at the Jedi Temple when the Jedi Purge began, and was also a close confidant of Padmé’s in the Senate. Certainly, the new Empire would be watching him closely and may inquire about the identity of his new daughter who just happened to appear right after the late-Senator Amidala was laid to rest. To throw them off the trail, then, Bail had to create the ruse to ensure that Leia would never speak of Padmé publicly, and to guarantee that the Empire would not discover Leia’s true origins. This was why the woman was necessary, to act as a temporary buffer against watching eyes, and as a long-term deception to ensure Leia would never be questioned about her ACTUAL mother. In short, what Leia never knew could never hurt her. Leia viewing the portrait of one of Naboo’s former queens, Padmé Amidala. Furthermore, in the second issue of the Princess Leia comic series, Leia arrives on the planet Naboo only days after the destruction of the First Death Star. There, in the streets of the capital city of Theed, she comes across a portrait of Queen Amidala. Viewing the mural, she is taken aback when she thinks the woman in the mural turns and looks at her, though she dismisses this and continues her journey through the city. Leia is completely unaware who this royal figure is/was, none-the-wiser that she was standing in front of a portrait of her ACTUAL mother. Then again, there is also nothing to indicate in this second issue that Leia even knows that her real mother was from the planet Naboo. Why would she? Leia believed her real mother was a beautiful and kind Alderaanian, and that she died when Leia was very young. As modern-day myth, Star Wars lends itself to different experiences and interpretations, and that is why I love it. When I watch the movies, read the books or comics, sit down to watch The Clone Wars or Rebels, and play the video games, I engage IN and WITH the myth-making. The way I experience and interpret Star Wars is meaningful to me in a way that, at times, may line up with the way others interpret it and, at other times, will be entirely my own and fundamentally different than others. So, while my experience leads me to believe Leia was discussing a real woman she was led to believe was her real mother for her safety, others might see something different. As one person noted in a comment on the previous post, perhaps Leia had a connection through the Force with her mother, and she is describing the impression of Padmé that was left there by the Force. [ii] Either way, it is a matter of how one wishes to experience and interpret the scene, and since the Story Group has not provided a definitive fix in the new and official canon, one can believe what they wish: that Leia is describing a flesh/blood woman she thought was her “real mother” OR someone she feels connected to through the Force. 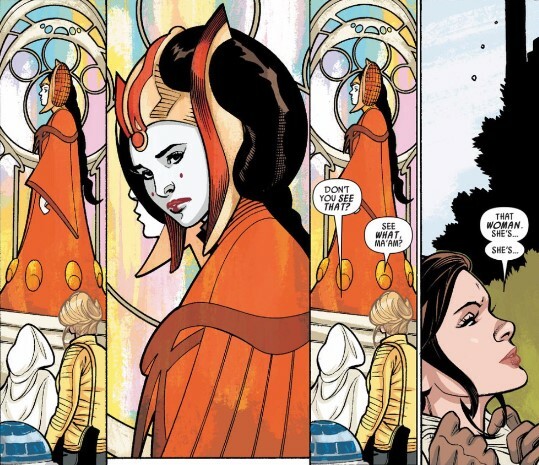 One way or another, though, I hope we can all agree that it would be great to see this continuity error get a fix and, while they are at it, maybe we could also get to experience a story in which Luke and Leia finally learn more about Padmé Amidala, their real and actual mother. [i] Remember how Vader taunts Luke on the Second Death Star: “So, you have a twin sista…your thoughts betray her, too.” This is the moment Vader realizes he has a daughter. [ii] Go check out the comment thread from Part I. Lots of great thoughts and ideas!